The Highland Park 12 year old Single Malt Whiskey is distilled on the largest of the Orkney Islands, ten miles off the coast of northeast Scotland. Even though Highland is part of the name, this is an Island whisky not a Highland whiskey. Highland Park is one of only a handful of distilleries that still malts their own barley and then dries the barley with local peat. Malt Whiskey is made with barley, they soak the barley in water for a few days then spread it out on the malting floor to germinate. During the germination process the starch in the barley turns into sugar (the sugar will later be turned into alcohol), at the proper time the barley is transferred to a kiln to be heated, which stops the germination process. Highland Park uses peat from different levels of the bog to impart unique flavors to the barley. Most Scotch Whisky is aged in used American oak Bourbon barrels, but Highland Park uses Spanish oak Oloroso Sherry casks, which imparts very different flavors than the Bourbon barrels. The alcohol content is 43% or 86 proof. The color is amber honey yellow. The nose is beautiful and delicate, molasses, magnolia blossoms, green apple, new leather jacket, Band-Aids, and burning fall leaves (faint, not strong). That might not sound beautiful and delicate, but it would make a good men’s cologne. 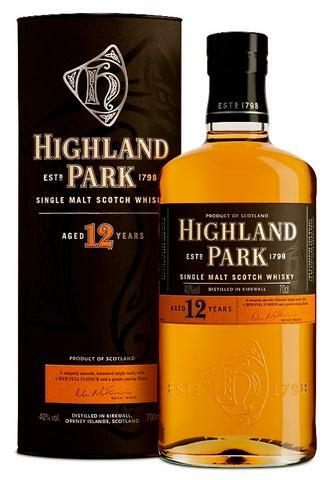 The Highland Park 12 year old is a balanced peated Malt, the smoke and the earthy flavors, while present are subdued and part of a larger mix. The flavors of the Highland Park bloom as they go along, a first the Whisky tastes smokey and mellow, then flavors of honey, orange peel, fudge, dried and/or candied fruit, tar and earthy, chewy peat build to a crescendo. There is a slight bite from the alcohol on the backend, followed by a long honey and baking spices finish. The Highland Park 12 year old is a superb sipping whisky. Balanced, flavorful, rich and decadent, this tastes expensive, though it is more in the middle tier for Single Malt. The Highland Park 12 evokes another time and place, there is nothing particularly modern about this Whisky and that is part of the attraction. The Highland Park 12 has the ability to change your frame of mind, at least until you finish your glass.